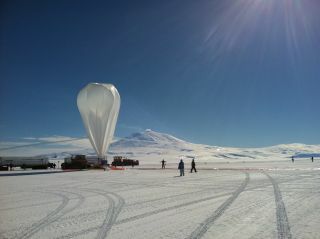 A U.S. science balloon is launched from Antarctica during the December 2012 season. It's tough to be a balloon over Antarctica. Most don't last more than a few weeks, but the Super-TIGER cosmic ray detector has been floating over the South Pole for 46 days and counting. The Super-TIGER mission officially shattered the record for longest-running balloon-borne experiment in Antarctica on Saturday (Jan. 19), scientists said. The project launched from the southernmost continent's Ross Ice Shelf on Dec. 9, and has already surpassed the previous record of 42 days, set by another cosmic ray detector, Cream I, which flew in the winter of 2004 to 2005. "At 42 days of flight Super-TIGER is now the longest scientific balloon mission! We have over 50 million events!" mission scientists wrote on the project's Facebook page Jan. 19. "Records are made to be broken!" Super-TIGER has circled the South Pole two and a half times, floating at a height of about 130,000 feet (40,000 meters), which is roughly three or four times higher than passenger jets fly. From its high-up perch, the balloon-borne instrument can catch cosmic rays (charged particles from deep space) which are typically blocked from reaching the ground by Earth's atmosphere. And lifting off from Antarctica is a boon, because the wind over the South Pole, called the polar vortex, tends to bring balloons back around in a circle to where they started, making them easy to retrieve after they've come back to the ground. Furthermore, the sun never sets during Antarctic summer, which helps balloons stay aloft. "If you fly from northern Canada as we used to do, the helium in the balloon cools at night and the balloon starts to descend," Binns said in a statement. "The only way you can keep it up there is by dropping about 100 pounds of ballast. So because of the day/night cycle, flights are limited to about 40 hours, or two days. In Antarctica you can stay up much longer because you don’t have that problem." But while Antarctica is perfect for balloons, it's less than ideal for humans. A day when the wind chill is above minus 75 degrees Fahrenheit (minus 59 degrees Celsius) is considered pleasant. "Wednesday we had great weather here in McMurdo — just about freezing," team member Ryan Murphy wrote today (Jan. 23) on his blog, Super-TIGER on the Ice. However, the close-knit group of scientists who stay at McMurdo Station, the home base for U.S. research in Antarctica, find ways to amuse themselves. The scientists have regular Wednesday night soccer games, Murphy wrote, and the Super-TIGER team even worked with researchers back at Washington University to photograph a "trophy" to commemorate their record-setting flight. "Through the Photoshop skills of the team back at Wash U, we now have a picture of an awesome real-looking trophy for the longest Antarctic balloon flight," Murphy wrote of a bowling trophy made to look like an official NASA commemoration of Super-TIGER's achievement. "This trophy does not exist. But I kind of wish it did." Super-TIGER isn't the only balloon-borne experiment launched this season from the South Pole. The Balloon-borne Large-Aperture Submillimeter Telescope (BLAST) experiment launched Dec. 25 to study star formation in the Milky Way, while the EBEX telescope took flight on Dec. 19 to survey the cosmic microwave background radiation left over from the Big Bang.